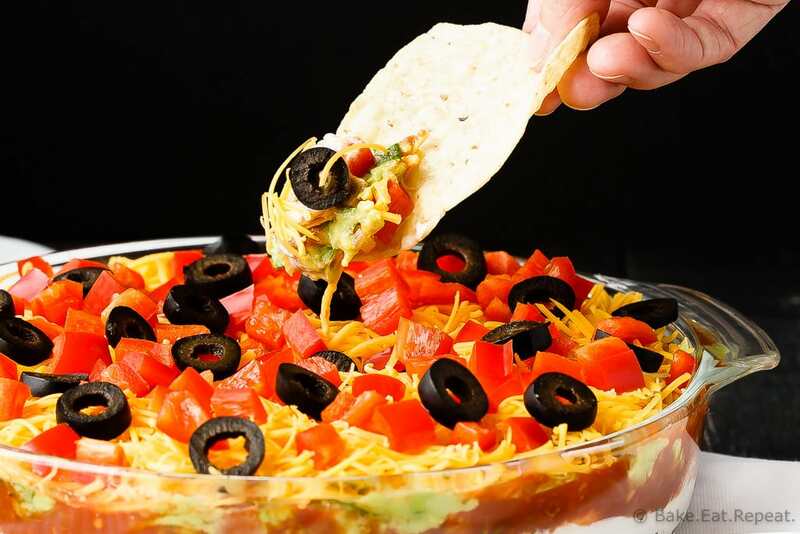 Mexican 7 Layer Dip Recipe - from Bake.Eat.Repeat. Quick and easy Mexican 7 layer dip – takes minutes to make and is an absolutely fantastic appetizer or snack. Everyone will love this! You know how when you’re a kid, there are all sorts of foods that you think are absolutely awful, and then you grow up and realize that they’re actually the best thing ever? Yeah, this Mexican 7 layer dip is that food. I said the same thing about guacamole, and so I guess it’s not really a surprise that 7 layer dip was like that for me too. It does use guacamole in it and all. My kids won’t touch this stuff. They’re totally crazy. But then, I wouldn’t have when I was a kid either. To be honest though, I don’t know if I even tried 7 layer dip until I was in my twenties. I feel like I missed out on a lot of years of enjoying a fabulous appetizer! If you’ve never made 7 layer dip, it is seriously the easiest appetizer in the entire world. It typically starts with refried beans for the bottom layer, but, um….I don’t like them. That’s one of those things that did not change when I grew up. Still hate ’em. But black beans I like, so that’s what I use, and I think it’s better that way! I also use homemade guacamole, but have also just used chopped up avocado instead and that is still really good. This dip is basically just spreading a bunch of different ingredients into a dish and voila – an amazing appetizer. Or meal. Whatever. We’re not above just sitting down with this dip and some tortilla chips for supper. Also, if you want to add a few other things and make it even more layers, that’s great too. I’ve made it with more things in it, throwing in corn, chopped tomatoes, green onions, and anything else that can work with Mexican food that I happen to have lying around. It’s all good. But for the recipe I stuck with my favourite seven things. It is Mexican 7 layer dip after all. And it’s fantastic. Quick and easy Mexican 7 layer dip - takes minutes to make and is an absolutely fantastic appetizer or snack. Everyone will love this! Place the black beans in an 8 or 9 inch baking dish (I used a 9 inch round dish, but an 8x8 inch square dish works just as well). Mash the beans with a fork and spread them to cover the bottom of the dish. Spread the sour cream on top of the beans, then the salsa, then the guacamole. 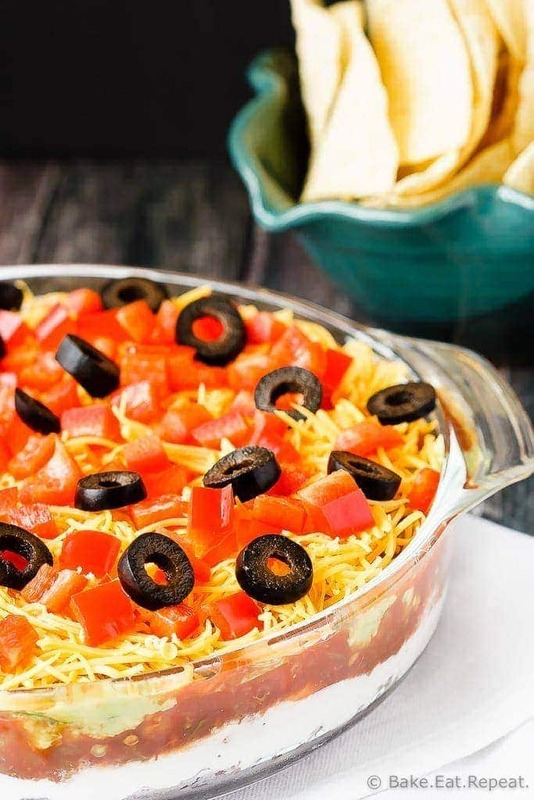 Sprinkle the shredded cheese over top of the guacamole layer and top with the chopped bell pepper and black olives. Cover and chill until ready to serve. Serve with tortilla chips for dipping. I love your recipes, and I also make a recipe like this one, but I will try this one also. I think everyone likes these easy recipes, cause it hot summer and we don't make these that often, during the year. I make it with taco meat and shredded lettuce. There are so many variations. Your imagination is the limit. So many variations! I think that's what makes it so great! You know, I've never actually made a 7 layer dip before, but it's one of my favorite appetizers! My aunt makes a similar version for family parties, and I can't stop eating it. I will definitely have to try this out! I think I could make a meal out of this! 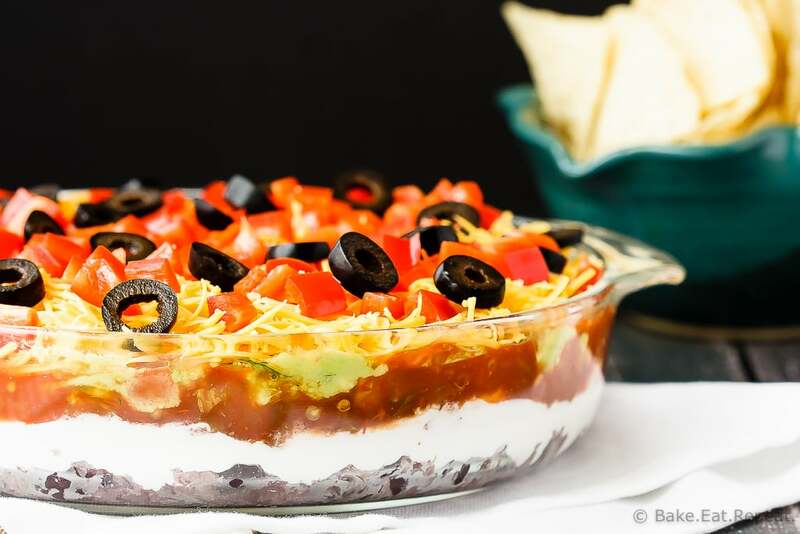 This seven layer dip is my exact kind of party food- love it!